GBP USD, Time Frame H4. Tenkan-Sen and Kijun-Sen are influenced by “Dead Cross” (1). 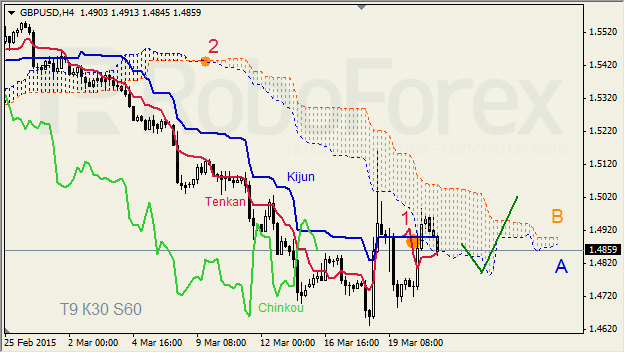 Chinkou Lagging Span is below the chart, Ichimoku Cloud is going down (2), and the price is below Tenkan-Sen. Short-term forecast: we can expect resistance from Kijun-Sen.
GBP USD, Time Frame H1. 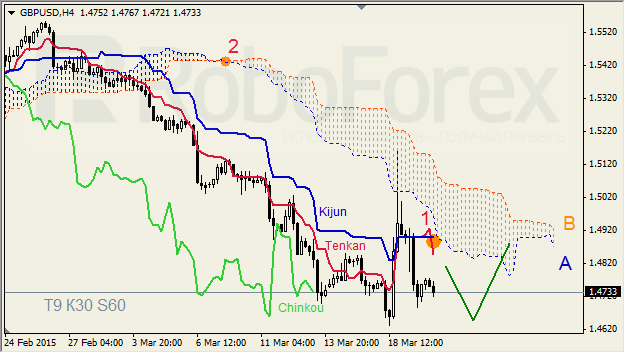 Tenkan-Sen and Kijun-Sen intersected below Kumo Cloud and formed “Golden Cross” (1). Chinkou Lagging Span is on the chart, Ichimoku Cloud is heading down, and the price is between Tenkan-Sen and Kijun-Sen. Short-term forecast: we can expect resistance from Tenkan-Sen – Senkou Span A, support from Kijun-Sen, and attempts of the price to stay inside the cloud. 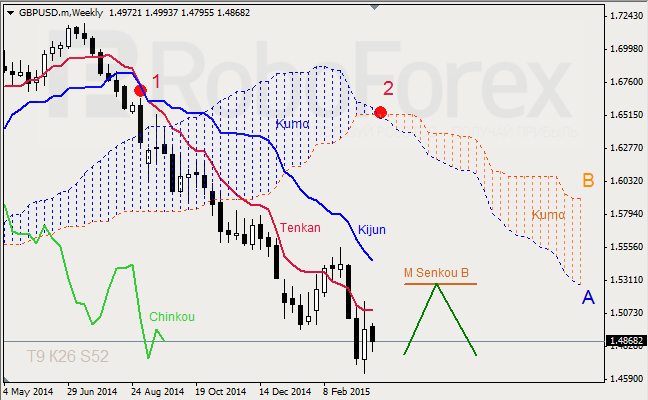 GBPUSD Ichimoku Cloud Analysis 20.3.2015 . 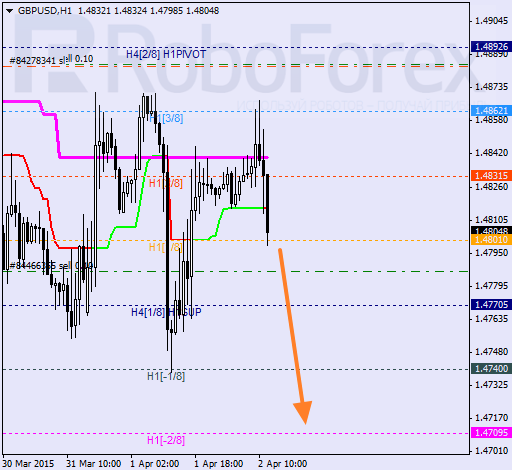 GBP USD, Time Frame H4. Tenkan-Sen and Kijun-Sen intersected again below Kumo Cloud and formed “Dead Cross” (1); Tenkan-Sen is directed downwards. Chinkou Lagging Span is on the chart, Ichimoku Cloud is very narrow and continues going down (2), and the price is below the lines. 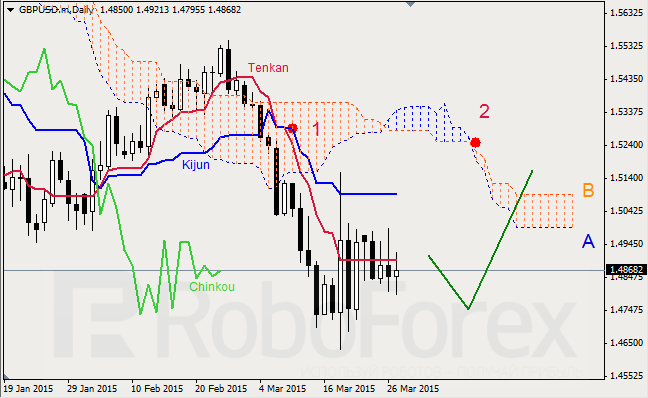 Short-term forecast: we can expect resistance from Tenkan-Sen, and attempts of the price to stay inside the cloud. GBP USD, Time Frame H1. Tenkan-Sen and Kijun-Sen are influenced by “Dead Cross” (1). 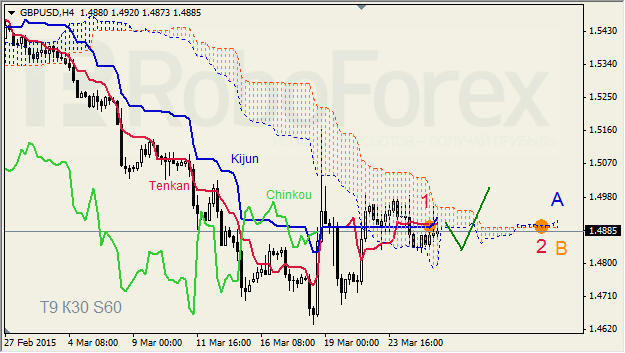 Chinkou Lagging Span is below the chart, Ichimoku Cloud is heading down, and the price is below the lines. Short-term forecast: we can expect resistance from Kijun-Sen, and decline of the price. 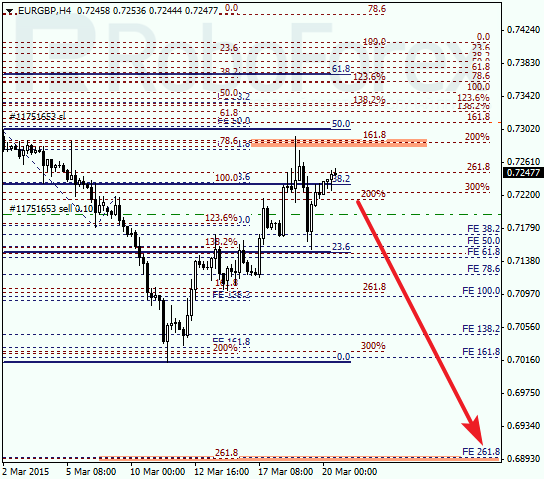 GBP USD, Time Frame H4. Tenkan-Sen and Kijun-Sen are influenced by “Dead Cross” (1). Chinkou Lagging Span is above the chart, Ichimoku Cloud is going down (2), and the price is near the cloud’s lower border. Short-term forecast: we can expect support from Tenkan-Sen – Senkou Span A, and attempts of the price to stay above the cloud. GBP USD, Time Frame H1. Tenkan-Sen and Kijun-Sen are influenced by “Golden Cross” (1). Chinkou Lagging Span is above the chart, Ichimoku Cloud is heading up, and the price is between Tenkan-Sen and Kijun-Sen, inside Kumo. Short-term forecast: we can expect resistance from Senkou Span B and support from Senkou Span A.
GBP USD, Time Frame H4. Tenkan-Sen and Kijun-Sen are forming “Dead Cross” inside Kumo Cloud (1). Chinkou Lagging Span is on the chart; Ichimoku Cloud is starting to go up (2). Short-term forecast: we can expect attempts of the price to stay above the cloud. 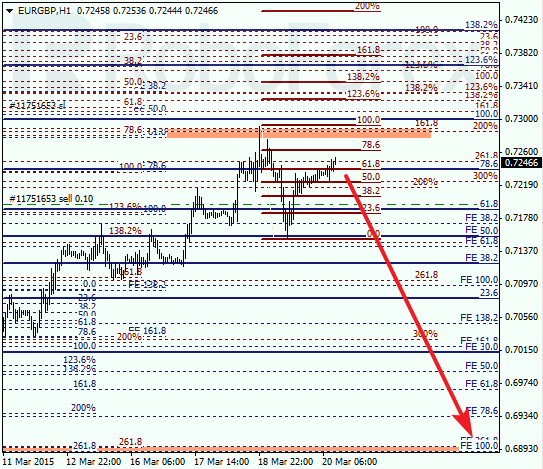 GBP USD, Time Frame H1. Tenkan-Sen and Kijun-Sen are forming “Golden Cross” (1). Chinkou Lagging Span is above the chart; Ichimoku Cloud is heading down. Short-term forecast: we can expect resistance from Senkou Span B. Pound is attempting to leave its consolidation channel. Earlier the price rebounded from the 4/8 level and right now is moving below Super Trends. If the market is able to stay below the 2/8 level, it may continue falling to break the 0/8 one. The pair is moving in the middle of the H1 chart below the 4/8 level. It bears are able to break the 3/8 level and keep the price below it, the next target will be at the 0/8 one. I’m planning to move the stop loss to breakeven when the pair breaks a local low. 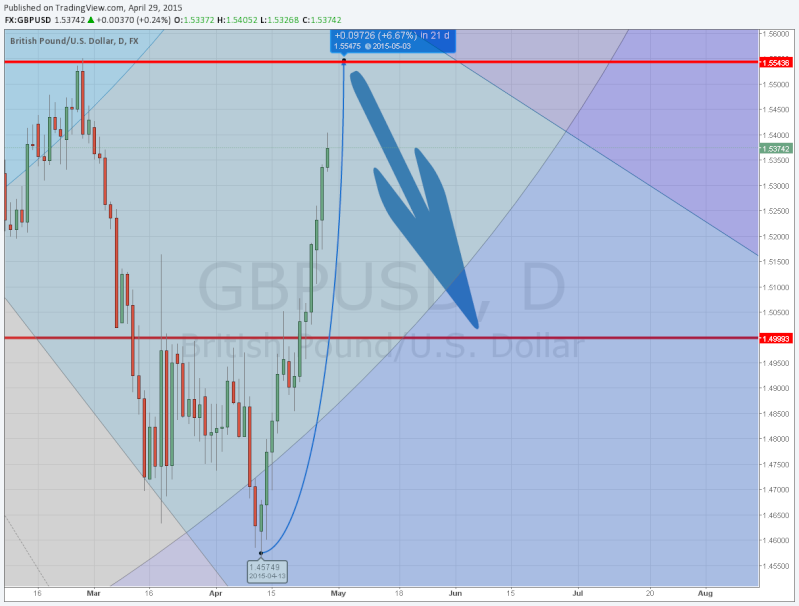 GBPUSD, Time Frame Weekly. Tenkan-Sen and Kijun-Sen are still influenced by “Dead Cross” (1); Kijun-Sen and Senkou Span A are directed downwards. 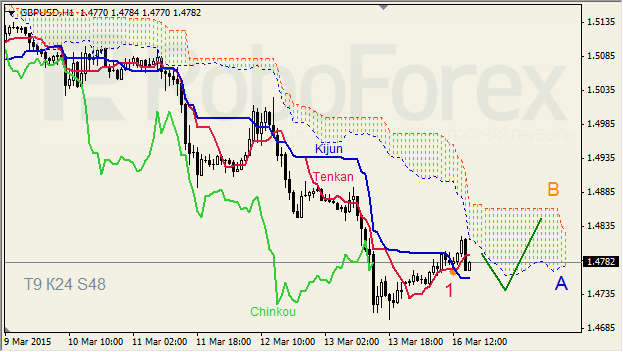 Ichimoku Cloud is going up (2), Chinkou Lagging Span is below the chart, and the price is below the lines. Short‑term forecast: we can expect growth of the price towards resistance from Kijun-Sen and M Senkou Span B.
GBP USD, Time Frame Daily. Tenkan-Sen and Kijun-Sen intersected inside Kumo Cloud and formed “Dead Cross” (1); all lines are horizontal. 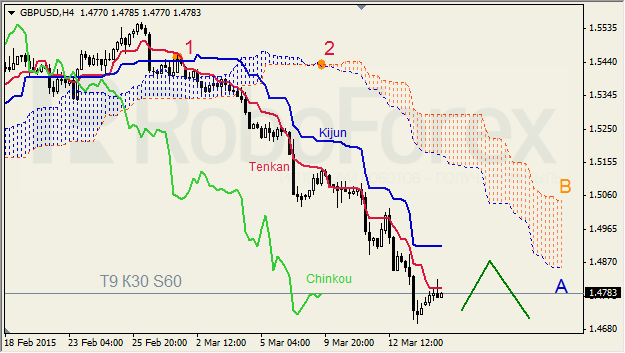 Ichimoku Cloud is going down (2), Chinkou Lagging Span is below the chart, and the price is on Tenkan-Sen. Short‑term forecast: we can expect resistance from Tenkan-Sen, and attempts of the price to stay above the cloud. Pound is still consolidating. Earlier the price rebounded from the 4/8 level and right now is moving below Super Trends, which are still influenced by “bearish cross”. If the market is able to stay below the 2/8 level, it may continue falling to break the 0/8 one. The pair is moving in the middle of the H1 chart below the 4/8 level. If bears are able to break the 3/8 level and keep the price below it, the next target will be at the 0/8 one. I’m planning to open another sell order during a correction. Pound has been able to stay below the H4 Super Trend and the 2/8 level. In the nearest future, the pair may break the 0/8 level and then test the -1/8 one, which may later become the starting point of a new short-term correction. The pair is moving at the bottom of the H1 chart. If the price is able to stay below the 0/8 level, it may continue falling inside “oversold zone”. If later the price breaks the -2/8 level, the lines at the chart will be redrawn. Bears made an unsuccessful attempt to press the pair, and she hit the resistance level near 1.5200, it has risen to the level of 1.5261. Thus, it may test resistance around 1.5290 in the short term, designated by us as the nearest target bulls. I think it will go up over your lines. Come to the Serbian part of the forum a little bit to talk! Okay okay but tomorrow ,not now. This pair had a differently directed trend on Friday. Bulls broke downward trend and returned the pair to morning level. Today it will be traded into small range. 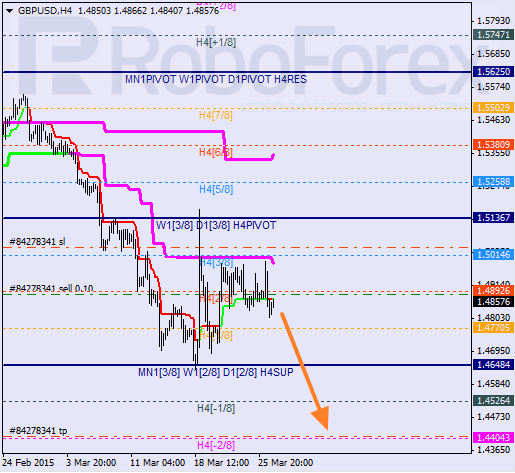 H1, GBPUSD made a new wave through to 1.5647 resistance level. 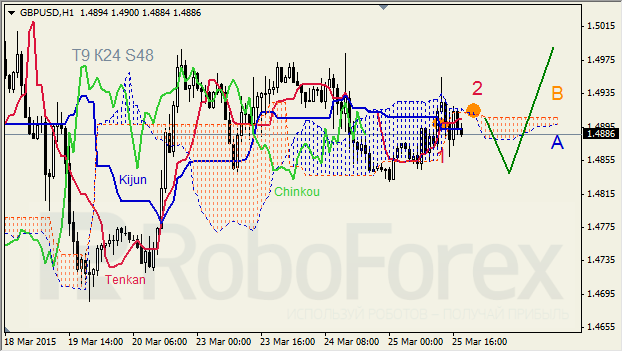 This pair got a strong 1.5579 support level, and now it forms the third upward wave. 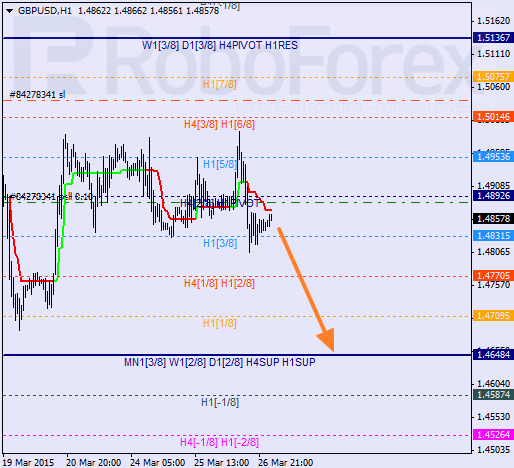 The pair will go down to 1.5465, then to 1.5450 further down, we'll see what happens. 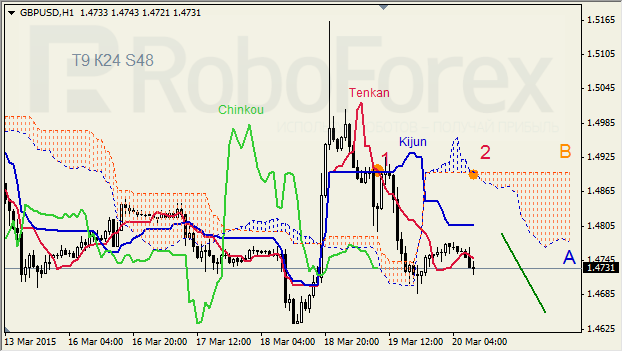 Top target is maximum 1.5530, I think flat will continue and now it is in the flat. 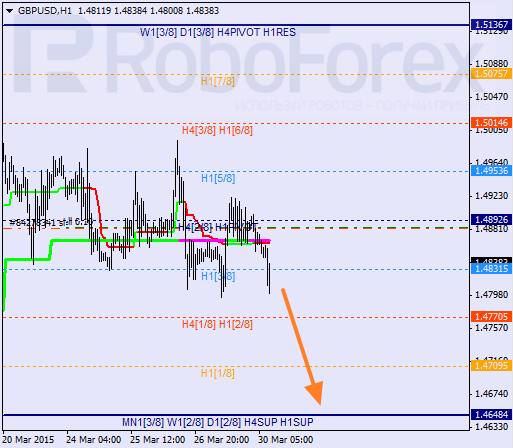 The pair goes up to break through 1.5530 price and then fall to the 1.5480 point again. Meanwhile we are waiting for breakdown of the currency. The pair broke resistance of 1.53 and continued to rise even before London opening, so from the reached highs it is likely to roll back during the European session to support 1.53, and from there it would continue growth, nearest goals for Bulls in this case will be the levels of 1,54- 1,55. Otherwise the pair will stay in the channel 1,53-1,52. 22.09.2015 18:34 GMT+1 - GBP/USD Intraday: under pressure. 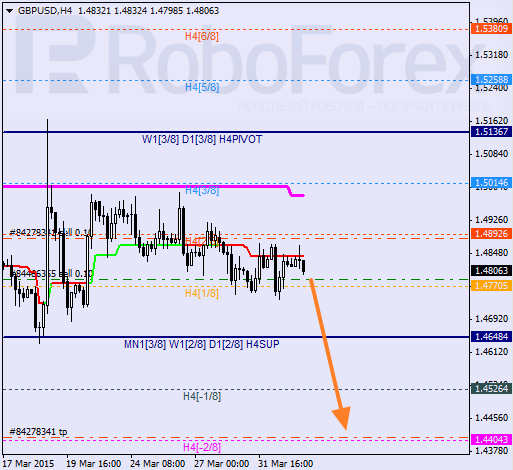 Our preference: Short positions below 1.5485 with targets @ 1.533 & 1.529 in extension. 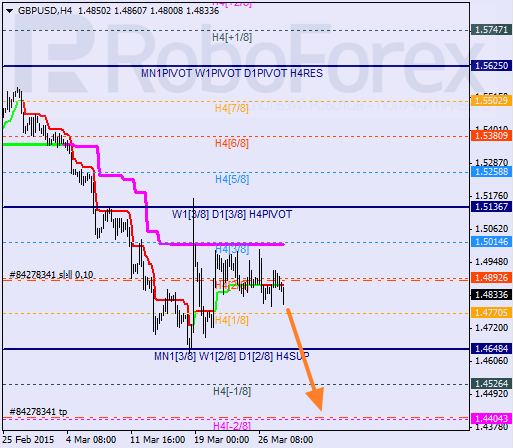 Alternative scenario: Above 1.5485 look for further upside with 1.553 & 1.557 as targets. After a protracted decline during 9 trading sessions in run, over the recent time the currency pair GBP/USD has been developing correctional movement , as it can be seen in the chart H4, in which our pair is moving in a downward trading channel, rebounding from its upper border. Growth is limited by resistance levels 1.5174 and 1.5213, and the upper border of the channel, from which we can consider sales. Levels of support for today are around 1.5105 and 1.5066. There is a very high probability of rolling back to the northern direction today. The pair reached the lower boundary of the downward price channel and turns to the northern direction. Stochastics on the daily chart turned North. Probably we will buy the pair. Yesterday the currency pair GBP/USD was traded within the range 1.4475 - 1.4379, and now H1 clearly shows that it is traded at the lower border of the channel between the support levels 1.4365 and 1.4324 and resistance levels 1.4420 and 1.4461. Selling the pair today is worth considering if it will exits the channel to the south. On Monday, I do not expect that the pair GBP/USD will show strong movements cause there is no significant news for the UK and the US. I think the pair will be traded in a small range with a tendency to drop. At the bottom, the key level will be the mark 1.4451 (Friday's low). In case it is broken, the next level will be support 1.4408 , but I doubt that we'll get it on Monday, the pair is likely to remain within the 44 figure.